Welcome to another Ubuntu Developer Week! No matter if you are interested in package maintenance or integrating software into the Desktop, or learn more about the infrastructure we use, everything is covered in Ubuntu Developer Week. 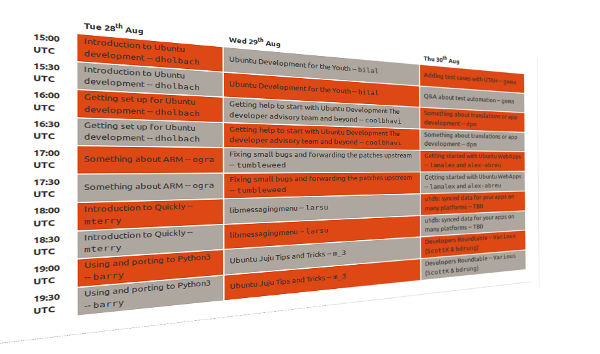 Join us from 28th-30th August 2012 in #ubuntu-classroom on irc.freenode.net and find out more. Not only information will be shared, but we will also have live demonstrations, which will make it easier to understand how it all works. Also is this a great opportunity to get to know Ubuntu’s developers and make friends in the Ubuntu community. Among the topics are: Getting Started with Ubuntu Development, ARM hacking, Writing Apps with Quickly, Python3, Fixing bugs in Ubuntu, Desktop integration, Using Juju to deploy services, Ubuntu’s QA infrastructure, Ubuntu WebApps, Ubuntu One DB, and many other bits and pieces. Check out https://wiki.ubuntu.com/UbuntuDeveloperWeek to find out more. We look forward to seeing you at the event!